a starch, soap and candle business in New York City. For the first one hundred years, the company did all its business in the United States. 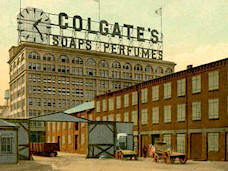 However, in the early 1900s, the company began an aggressive expansion programme that led to the establishment of Colgate operations in countries throughout Europe, Latin America and the Far East. Colgate-Palmolive has set up operations in Turkey, Pakistan, Saudi Arabia, Eastern Europe and China, becoming a truly global consumer products company, worth $6.6 billion and selling in more than 160 countries. Colgate-Palmolive's five main sectors of business are: Oral Care, Body Care, Household Surface Care, Fabric Care and Pet Nutrition and Health Care. In the area of Oral Care, Colgate-Palmolive is the world leader in toothpaste. Since 1980, the company has increased its share of this market by more than 12% to over 40% today. Oral care revenues have grown significantly in recent years and in 1991, they exceeded $1.3 billion. As a result of the company's heavy investment in research and technology, it has developed many successful toothpastes, rinses and toothbrushes. To strengthen its presence in professional products, Colgate-Palmolive bought the Ora Pharm Company of Australia and the dental therapeutics business of Scherer Laboratories USA in 1990. For many years, the company has had a strong dental education programme in schools throughout the world and has maintained a close partnership with the intemational dental community. Recently Colgate-Palmolive has enlarged its school education programmes to cover rural areas as well as townships in developing countries. For the last three years, the company has been a major sponsor of the Intemational Dental Congress, the world's largest and most prestigious dental meeting. The company has always paid close attention to the environment. It has already made great progress in the use of recyclable bottles and packaging materials. In 1990 the American Council on Economic Priorities chose Colgate-Palmolive as one of the four most socially responsible companies in the United States. COMPLETE THE FOLLOWING ARTICLE WITH EITHER THE "PRESENT PERFECT" OR "PAST SIMPLE" CHOOSING THE BEST ALTERNATIVE FROM THE MENU. THEN CHECK YOUR ANSWERS HERE. operations in Turkey, Pakistan, Saudi Arabia and China. share of this market by more than 12% to over 40% today. they - exceeded have exceeded $ 1.3 billion. the four most socially responsible companies in the United States.